Things have been so full on the past two weeks; I have found myself saying every day ‘I need to write a blog’ but there simply hasn’t been an opportune time to gather my thoughts enough to sit and write anything! It feels like we are in the fast lane and everything around us seems to be moving at an incredibly fast, yet smooth pace. I love the fact that when we commit our ways and our days to the Lord, He orders everything. I have found that often during the night lately, I will get a download about the next step, and I wake up knowing what I need to sort the next day. When you have God as the CEO of your company, it sure makes the ride fun and exciting. Everything that has been done thus far has been in a very orderly fashion without any hassles at all. I can report on the latest progress – all the official paperwork for our lease has now been completed, and we take over the shop on December 1st, with the plan being to open the shop the week before Christmas. We need to spend a week in Lower Hutt training with Bernina before opening day. Shop signage is underway and booked for the big reveal a couple of days before we open. Let’s face it, there is talk around town that Bernina is coming back, so we figured we can’t keep it a secret forever. We LOVE our new logo and the way it is being used in the shop and on business cards and stationery. Our online store is almost complete. The guys at Ninety Black (which is our new Advertising Agency) are being incredibly patient as I try and create the inventory of all the stock we have for them to load on to the site. This is a huge time consuming process, and I have been threatening to hide myself away in their boardroom so I can get the job done without any interruptions. The guys at Vend are also waiting for my inventory so it can be loaded on to the merchant site. I am amazed at all the things which need to be done, but it’s step by step and it’s starting to come together, slowly but surely. I don’t think I have ever walked in to a shop and taken note of the counter top before. Now that I need one, I am spending time trolling through Pinterest, and taking much more notice of other retailers’ counters. They certainly vary a lot in shapes and sizes and functionality. I’ve managed to find the ‘perfect’ counter, which I am told shouldn’t be too tricky to construct. A friend recommended a chap who can build, paint AND do odd jobs for us to get the shop interior ready for business. Of course the recovering patient is finding that all a bit frustrating as he would like to do the work himself. We both know his recovery is more important, so some jobs have had to be delegated to others. Sons also come in handy. Son 1 came for a weekend and helped to reorganize our container, and last week son 4 arrived to work for a few days. He has sanded back numerous chairs which need reupholstering. I am delighted with the results. Some lovely old chairs have received a new lease of life with a good sand, an application of wax and/or whitewash and are now waiting to be reupholstered in beautiful fabric. We met a neat young lady who loves recovering chairs and she will be very busy this week putting some new life into some old girls. For a long time I have had images of ladies sitting on lovely comfortable chairs in our shop, with a quilt over their knee and a needle in hand, ready to stitch or quilt the next row. I’m hoping our newly recovered chairs will be just right for them to do that. Judging from the first completed seat I saw on Friday, I can’t wait to see how the rest turn out in the next week. Tonight we are in a motel in Auckland, after driving up from a family wedding in Tauranga yesterday. The next three days are fully booked with appointments to meet potential suppliers in the Auckland area. We are looking for products that will complement what we already have to sell in our shop and we decided the best way to do that was to meet our suppliers in person and see what they’ve got to offer. We have google maps all set up and will start in the south of the city tomorrow and make our way north. We already have some fabulous products – one of my concerns is that we might run out of stock, given that Taupo is a pretty popular tourist destination over the summer! I’m looking forward to putting some classes together that will whet the appetite of holiday makers, but that might just need to wait til we have been ‘in residence’ for a couple of weeks and I can get a gauge on what people want. 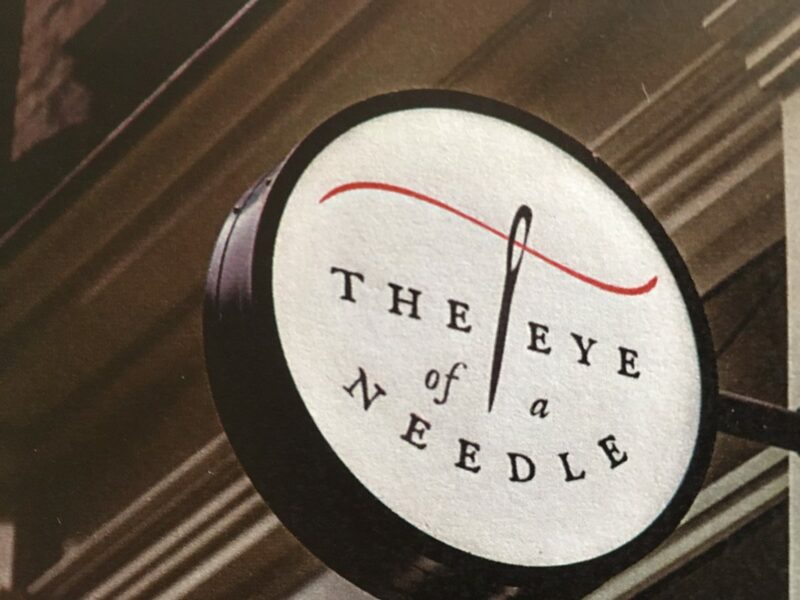 I hope you like our new logo for ‘The Eye Of A Needle’. It’s been fun working with the sign writers and designers, looking at what can go where on walls and windows. I’d love to hear your reactions too. Please feel free to add your comments to our Facebook Page, and LIKE us as we move into the next publicity stage, or subscribe to my blog and add a comment there. If there is a class you would like to take, or a new sewing skill you would like to learn, drop a note in the comments section, and I will see what I can do to pull a group together in the New Year. It’s going to be such fun. Even though there is much to do, I know that I was born for such a time as this, so I am embracing the experience and enjoying the ride!